As many of you may know, our beloved hygienist of 10 years, Joanne passed away in October from AML Leukemia, a form of blood cancer. Her battle with this cancer has touched us and we miss her deeply. Through all of her journey, she maintained a positive and uplifting attitude, reassuring the people around her that things would be fine because she would be “going to a better place.” During a time that it is so easy to mourn the loss of someone we love, we are choosing to come together and celebrate the blessings of her life instead. Through this celebration, we have decided to host a fund raiser for the Leukemia and Lymphoma Society (LLS) in her honor. Her daughter Megan is training for a marathon that will take place March of 2016 in Puerto Rico. All of the money raised for this race will go to the LLS. She has never run a marathon before and is certainly worried about all of the work that will go into training for it, but she humbly knows that her battle to train for this will be minor compared to the battles her mom fought. And of course nothing compared to the battles other patients deal with after being diagnosed with blood cancer. Please take the time to read her story. She is excited to be raising money and awareness for this cause. Her good friend is running alongside her for the same cause. Their goal between the two of them is to raise $5,800. We are proud of Megan, and we know Joanne would be too! So, in honor of Joanne and in support of Megan’s cause, we have decided to dedicate the entire month of November to raising money for her race and to raise awareness for the LLS. 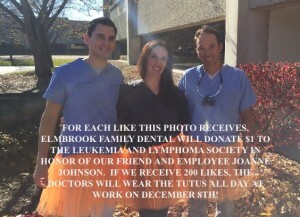 We will be posting the photo above of our 3 dentists with tutu’s on our facebook page. If the photo reaches 200 likes, each ‘like’ will be matched with a $1 donation toward Megan’s race up to the amount of $1000, and the docs will wear these tutu’s to work on December 8th. So, visit our page, like our photo, share the photo and encourage your friends and family to do the same! You can also donate to the cause directly in our office. For every dollar donation, you will receive an entry into a drawing for free custom whitening and a Sonicare toothbrush. If you can’t make it in to the office (no appointment necessary to donate and enter), you can donate on Megan’s web site directly. Only entries made inside the office will qualify you for the special drawing. Our staff will be sharing her story and wearing orange ribbons all month long. Follow the links below to Megan’s fund raising page and our facebook page. Thank you for supporting this cause!